Power transmission sprockets are toothed wheels that interlock with a chain, track or other perforated material. The teeth fit exactly into the item that it is designed to move, therefore they must be tough and hard-wearing. Sprockets differ from gears as they work independently and do not interlock. In power transmission applications, such as gearboxes, drive chains and conveyer chains, sprockets transmit shaft rotation to chains and vice versa. 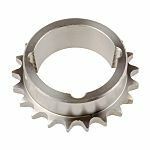 When there is an even number of pitches in the chain, by using a sprocket with an odd number of teeth, this results in uniform wear over both the chain and sprocket teeth.Within our range, we supply two main types of sprockets. 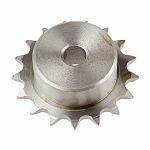 Pilot bore sprockets that are supplied with a standard shaft hole and must be rebored to fit the shaft it is to be used with. And tapered bush sprockets that have been already been bored to fit a bush to use with the shaft. Various numbers of teeth and pitches are available.